The TCMP facility uses high resolution mass spectrometers (Orbitrap Fusion™ Tribrid™ Mass Spectrometer & Orbitrap Fusion™ Lumos™ Tribrid™ Mass Spectrometer) and isobaric tandem mass tags (TMT) to quantify protein or phosphopeptide expression from cells, tissues or immunoprecipitated protein samples. 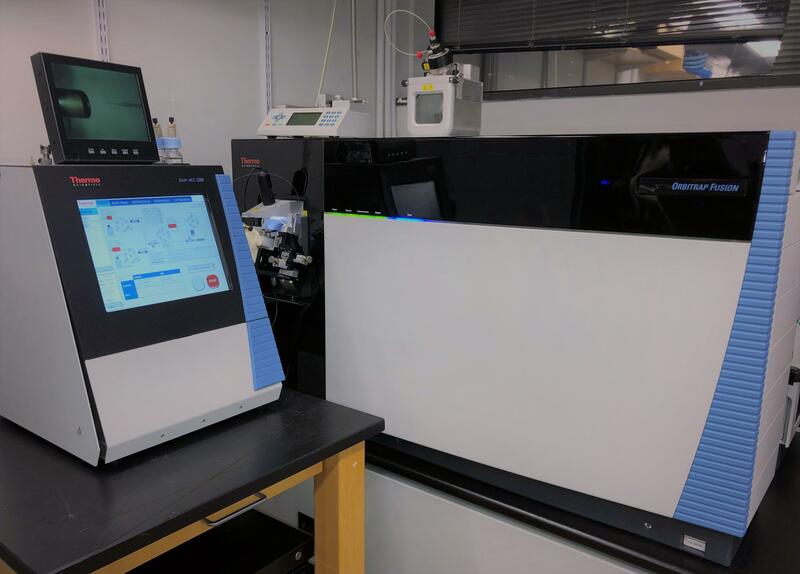 Our facility offers offline and online peptide fractionation combined with MS3 shotgun proteomics techniques to identify and quantify thousands of proteins in complex mixtures. A basic workflow includes extracting proteins from submitted samples followed by protein estimation, reduction - alkylation, precipitation, and enzymatic digestion. Digested peptides are conjugated with TMT reagents and combined into a single multiplexed sample. Multiplexed samples are loaded onto an in-house built capillary column where the labelled peptides are separated by hydrophobicity and charge. Eluted peptides are ionized and separated by m/z in the MS1 scan of tandem mass spectrometry. Ions are selected for fragmentation through collision-induced dissociation (CID) or Higher-Energy Collisional Dissociation (HCD). MS/MS spectra are matched to a protein database using a Sequest-based in-house built software platform. Most of the method and protocols, followed at TCMP were first developed in Gygi Lab at Harvard Medical School.